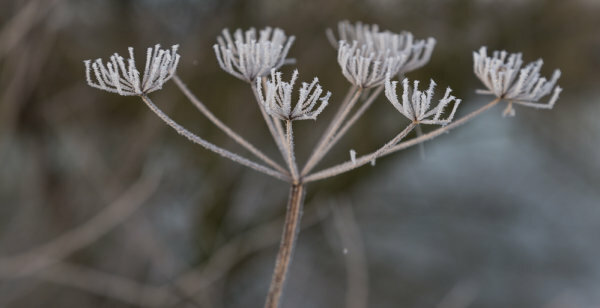 The dried flower heads of hedge parsley look beautiful bejewelled with ice crystals. I have a particularly soft spot for the winter skeletons of hedge parsley and you will find them in the foreground of many of my photos. And even better if they are encrusted in frost. On this particular morning I walked along the Thames from Sonning towards Shiplake. For some reason this stretch of the river seems to be a real frost hollow - if you walk in the other direction towards Reading the frost is nothing like so evident. It was cold and crisp with the sun making brief appearances through a veil of mist and making the frosted foliage sparkle.